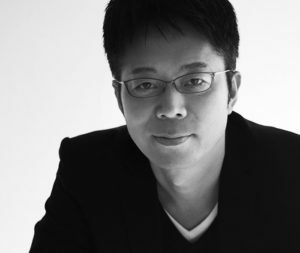 Japanese designer and artist, Tokujin Yoshioka has won many international design awards with many of his works chosen as part of permanent museum collections worldwide. What Do We Know About The Japanese Designer? 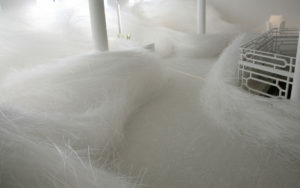 Tokujin Yoshioka was born in 1967, in Saga, Japan and grew up at the school of designer Issey Miyake. An apprenticeship that greatly influences his interpretation of design, leading him to experiment a language close to art with innovative shapes, techniques and materials to achieve surprising effects. Tokujin founded Yoshioka Inc, in 2000. He has worked with many international companies such as Hermes, Toyota, BMW, Kddi, Swarovski, Moroso, and the awards he has accredited are those of the most prestigious, as having his own collection extensively exhibited at the Museum of Modern Art in New York (MoMA), at the Center Pompidou in Paris, at the Vitra Design Museum in Berlin and at the Victoria & Albert Museum in London. 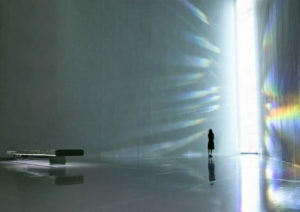 Tokujin Yoshioka, Rainbow Church, 2013. Museum of Contemporary Art Tokyo. The stained glass composed of 500 crystal prisms converts natural rays into rainbow color so that “miraculous light” appears in the space. Quiet and sedate but with great emotional loquacity. Raised at the school of the great Japanese designer Miyake, rather than devising objects, he designs sensations. In its poetic installations, the function of the object takes second place: a poor orthodoxy that raises the eyebrows to the purists and instead raises the hearts of ordinary mortals. Design awards include the ones given to the world’s most active designers, Design Miami / Designer of the Year, Elle Deco International Design Awards / Designer of the Year, Maison & Objet / Creator of the Year etc. It is chosen as “the 100 people Japanese respected by the world” by USA Newsweek magazine. 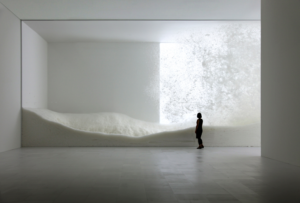 Snow / Sensing nature – Mori Art Museum, Japan (2010). In The Snow Yoshioka works this time with a soft material like the feather and integrating gravity and movement within the work itself. 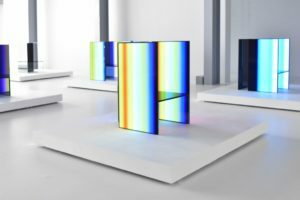 It’s called SF_Senses of the Future and is the scenographic work created with Oled lights by the designer Tokujin Yoshioka in collaboration with LG, winner of the Milan Design Award 2017. The installation, presented at Superstudio Più, won for its ability to involve the viewer and reconcile the conceptual, technological and narrative aspects in a single project. The work illustrates the human relationship with the natural world emphasizing the vision of Tokujin Yoshioka that places man at the center. A feast for the senses that offers visitors a glimpse of what the future holds thanks to the union of cutting-edge technology with innovative experimental design techniques. This installation was presented as a composite of several elements: the S.F. 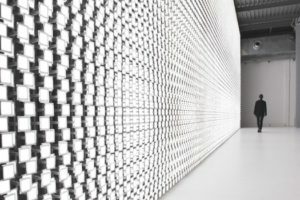 Chair, much more like a futuristic chair than a commonly used object, and the Wall of the Sun, a real wall of lights 16 meters wide and 5 meters high, made with over 30,000 single modules of light, which give the light barrier a sense of scary lightness. Seventeen S.F chairs were created by art using LG OLED screens. The chairs convey both a feeling of static and dynamism, thanks to flashes of light emitted by double panels, which recall the lightning speed of the frenetic flow of modern life. Visitors will have the opportunity to sit on S.F chair, experimenting with the future display technology. 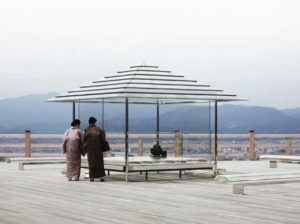 The Japanese artist has declared that the aim of the work is to represent the importance of man in the philosophy of design, through the union between the avant-garde technology of LG and the innovative experimental techniques of the designer. “This collaboration has been a great experience for me and at the same time a stimulating opportunity to create an artistic work that has never been seen before” said Yoshioka. 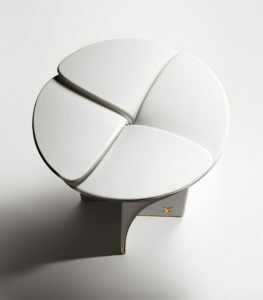 Blossom Stool is a minimal stool created by Tokyo-based designer Tokujin Yoshioka for Louis Vuitton. 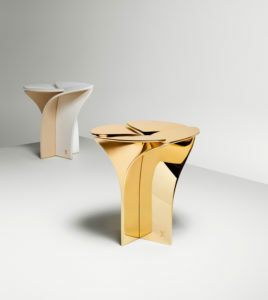 For creating the ‘blossom stool’, the Japanese designer was inspired by the company’s petal monogram and translated it into a symbolic piece representing the motion of blooming petals that transform into a bud. The seating object reflects on Louis Vuitton’s craftsmanship with wood and leather, featuring the techniques they have been cultivating throughout their long history. through its clean and clever design, the art object communicates an iconic message and travels beyond times, projecting not only the history but also the future of Louis Vuitton.